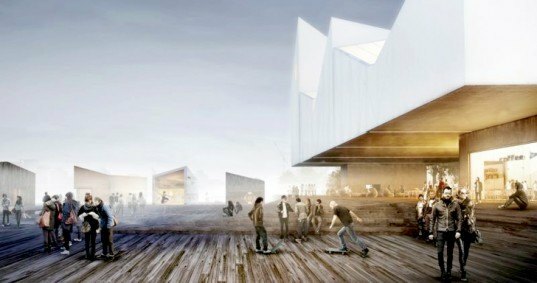 Warsaw-based studio WXCA won Estonia's Baltic Sea Park Competition with their design of floating pavilions situated around a square. 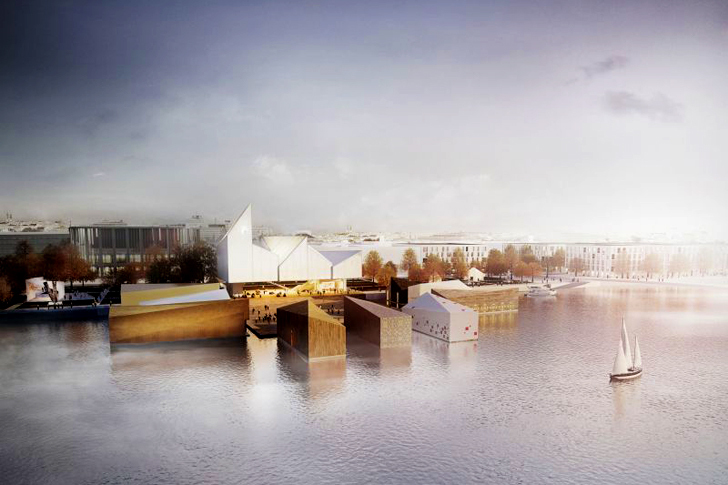 The floating Forum of Art is meant to enable integration and interaction between all Baltic countries and their artistic heritage, while also emphasizing a connection between the city center and the Pärnu River. The design is a multifunctional space that can be used as a venue for various cultural events-from concerts and performances to communal gatherings. It acts as the ending point of a path that leads from the Old Town to the riverside and can be attached to the pales during winter, when it is used as a jetty. The entire complex, together with the pavilions, can be transported to other locations. Typical northern architecture is transformed to fit public functions. The upper floors, traditionally used as warehouses (granaries) are used as “warehouses for art,” while the living area on the ground floor functions as a gallery space. Pitched roofs of the traditional houses create dynamic interiors with varying heights and enables flexible use. The project reinterprets urban structure and creates a mall-scale town that fits perfectly with the scale of Pärnu. The design envisions a multifunctional space that can be used as a venue for various cultural events-from concerts and performances to communal gatherings. It acts as the ending point of a path that leads from the Old Town to the riverside and can be attached to the pales to stay on the river also during winter, when it is used as a jetty. The entire complex, together with the pavilions, can be transported to other locations. Typical northern architecture is transformed to fit public functions. The upper floors, traditionally used as warehouses (granaries) are used as “warehouses for art,” while the living area on the ground floor functions as a gallery space. Pitched roofs of the traditional houses create dynamic interiors with varying heights and enables flexible use.